Yes! I spent the evening with them and it was super nice. They really enjoyed seeing you too! I can’t wait to find a moment to catch up just you and me! It will be soon! Have you ever considered the additional “insurance” of Hoof Armor along with the boots? I’ve used it twice for rides, and am kicking around using it on a new horse I just got that’s thin soled, and potentially on my endurance horse as well. The one ride I used it on was insurance in case my Renegades failed (surprise, they did). We went OT on that ride, but my horse finished sound as a pound, and that was over very sharp limestone. Did want to say thank you for the Scoot Boot collar you shared. Once I get my Paso’s heels where they need to be, I’m going back to them. They worked GREAT on my Paso mare, and I suspect if I’d known about the collar, they’d have been even better (slight twisting on the rears). Hi- thanks for the suggestion. It’s a good one. I actually have used pine tar as a help with sole sensitivity on occasion and after a trim and was kicking myself that I didn’t bring it as it’s not the same as something like hoof armor but it could just take some sensitivity out if it was minor. I’m also considering different pads that might hold up better without being too thick… looking for ideas there…. I was your In/Out Timer, and noticed your Scoots right off the bat. It wasn’t until you were heading out on the final loop that there was a quiet moment when you and I could talk very briefly about them, and frankly I was impressed that the boots were still on over that trail. And I LOVE the fact that half that set was Scoots. But I remembered you saying something about a bit of glue being used as well? I’m super glad to hear not only that they stayed on, but that you completed. Kudos!!!! I use Scoots for my hacking pony and love them, but my endurance horse I now keep shod on all four because the boots (first Gloves then Renegades) struggled to stay on her powerful stride with speed work up the mountains. I have been trimming and shoeing my own horses for 40 years, and you are 100% right – the trim is critical for keeping a strap-on boot on. But sometimes, depending upon the horse, even that isn’t enough when the terrain is demanding. What I have been hearing is the glue-on boots work great for the OD rides. So that is something I’m going to experiment with next year – the Scoot skins. Best of luck going forward with your horse, endurance, and the boots! PS – and I am a AERC Decade Team. 2000-2010. 😆 Fingers crossed the glue-on Scoot Skins will work on my mare because I’m getting tired of nailing on shoes. And I do plan for her to be my second Decade Team horse, so 10 more years on nailing on shoes with pads makes me want to cry. I didn’t glue at all this ride. I am hoping not to need shoes and I may try glue on in the future. I do believe right now that the right padding (not a pour in that gives constant sole pressure) is a good thing and I’m not sure if that works with glue or not- that’s a new world for me. I was super impressed that they stayed on but I believe 100% that the right barefoot trim is hugely responsible. When I was still using a farrier and sometimes metal shoes I never had an appropriate trim. That cost me lots of boot failure over a couple of years. I thought I couldn’t do Boots. In the end I’ve proven myself wrong yet again in the most amazing positive way!! It’s a small world … I’m the one that blogged about the Thoroughbred on the Scoot Boot site! We learn so much from each other. For those that do their own trims, think about getting an Electric Hoof Knife (I have no personal interest in the company!). It takes a little getting used to, but trimming is much easier and faster, and your back will thank you immensely. Don’t use the rounded rasps or the chain saw-like ones either; get the flat goat rasps instead. 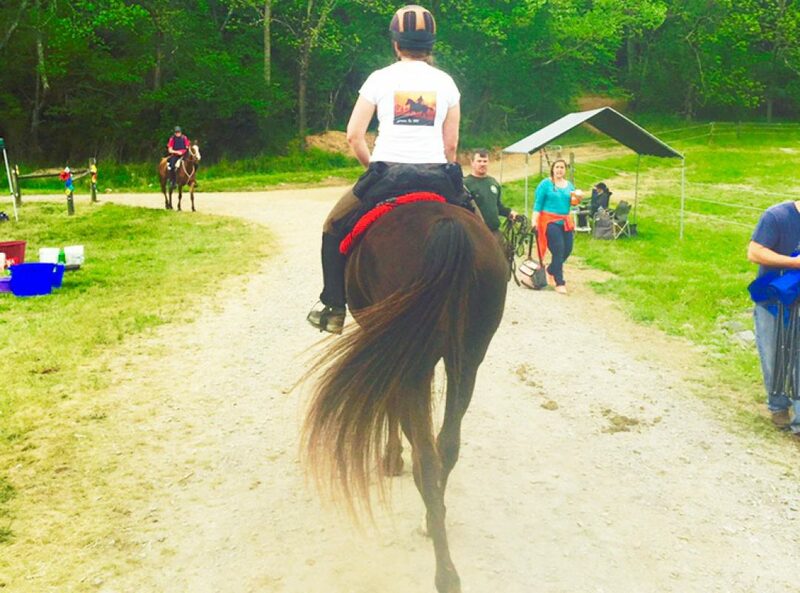 It’s all about a great ride on a great day with a great horse!